The Role of the Chorus in Shakespeare's "Henry V"
At first view, the Chorus in Shakespeare'sHenry Vsimply seems to serve two main practical purposes: to lead the audience through the play as regards content, and to form the audience's view on the character of King Henry V himself. The Chorus with his announcements, explanations, apologies, and appeals to the audience, while itself not being part of the diegetic world, underscores the assumption that the Chorus, represented by one single character, functions as a presenter of the play in general and of each act in particular with the rather practical aim to lead the audience through several changes of time and scene: "Carry them [the kings] here and there, jumping o'er times" (1.29). 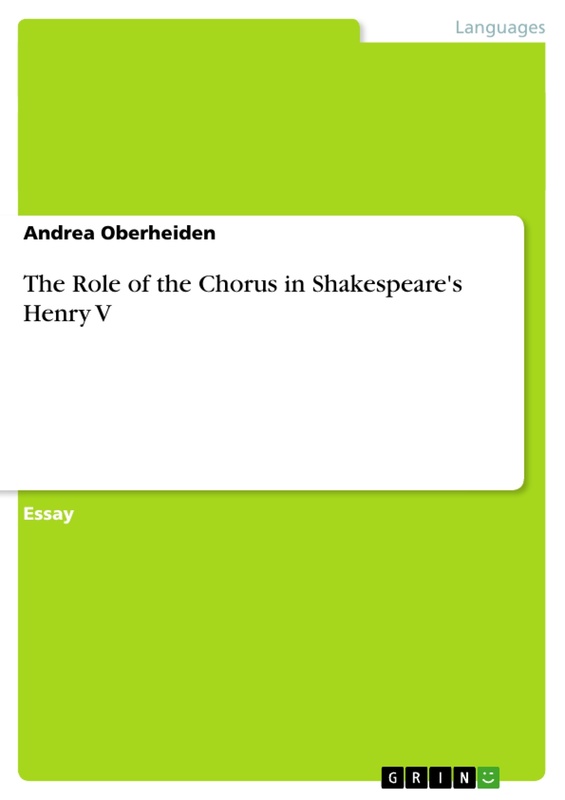 But understanding that as a reason, or even as a justification for the existence of the Chorus inHenry V, the question has to be raised why a chorus, which is after all rarely used in Shakespeare's other plays, is used specifically in this play. There are numerous Shakespearean plays in which a unifying authority would have been highly useful because of a complex structure of the particular play in regard to time and setting such as inMacbeth,King Lear,orThe Merchant of Venice, to mention just a few. Besides this technical function of the Chorus inHenry V,he also delivers a meaning with regards to content: He amplifies the greatness of King Henry by praising him perpetually. The fact that the Chorus is not part of the diegetic world helps to portray himself as an omniscient and reliable witness. He calls persistently upon the audience to imagine the King's splendor which is apparently too great to put appropriately onto a theater stage. Therefore, it seems to be a legitimate, though disenchanting question to ask if "this cockpit [can] hold / The vasty fields of France" (1.11-12). Thus, the audience is already asked at the very beginning to imagine something even greater than what it is about to see. But as we will see later, there are inconsistencies between the Chorus's statements and the actions that are taking place, figuratively verbalized by Andrew Gurr1: "The Chorus is a great painter of pictures, but they are never the pictures shown on stage". With those contradictions in mind, it can be questioned whether we really deal with an authoritarian and reliable speaker one-to-one purporting the audience's view by glorifying King Henry V, and by demanding the audience's imagination which is so much bigger than everything demonstrable "[o]n this unworthy scaffold" (1.10), or if we rather deal with a speaker that actually says so much more, or even something else, when he asks the audience to "[m]ind[...] true things by what their mockeries be" (4.1.53). As already mentioned, the theatrical device of a chorus is nothing typically used by Shakespeare. If we count both parts ofHenry IVas one, Shakespeare used a chorus only in four of his plays:Romeo and Juliet,Troilus and Cressida,Pericles, and the already mentionedHenry IV, parts 1 and 2. For further examinations, I want to take a closer look at the history of the theatrical chorus. Unlike in Greek drama, the chorus in Elizabethan drama, hence in Shakespeare's plays, typically consisted of one single character, on stage mostly dressed in black, who was used for narrative purposes. "Were now the general of our gracious empress, / (As in good time he may) from Ireland coming, / Bringing rebellion broached on his sword" (5.30-23). The Earl of Essex had led an English expedition to put down an Irish rebellion in March of 1599, which turned out to be a disaster by the end of September of the same year. This allusion, as Andrew Gurr put it, would have been an embarrassment after the Earl's return, and dangerous after he was put on trial in 1600, being executed in 1601. As already mentioned, there are also examples in Greek drama where the chorus did not participate in the action. In the works of Sophokles, the chorus had mainly the function to give warnings, or to commiserate while not being integrated in the plot whatsoever. The chorus as ancient lyrical genre mostly focused on myths and in the drama of classicism, the chorus returned as a more natural and foremost reliable figure. "O for a muse of fire, that would ascend / The brightest heaven" (1.2. ), "Now all the youth of England are on fire" (2.1), "A city on th'inconstant billows dancing, / For so appears this fleet majestical" (3.15-16), "With cheerful semblance and sweet majesty, / That every wretch, pining and pale before" (4.40-41), "due course of things / Which cannot in their huge and proper life / Be here presented" (5.4-6). Therefore, the elements of Shakespeare's character of the Chorus inHenry Vdoes not seem to be unique or extraordinary. But as we will see later, the most important characteristic of Shakespeare's Chorus is the fact that there are essential contradictions between what the Chorus foretells and what is eventually seen on stage. Something that severely questions the speaker's reliability, and which eventually leads to the question of his actual purpose. "And let us, ciphers to this great account, / On your imaginary forces work" (1.17-18), "Thus with imagined wing our swift scene flies / In motion of no less celerity / Than that of thought" (3.1­3), "Play with your fancies" (3.7). If the concern literally questioned if "this cockpit could hold the vasty fields of France", we would have to ask why there is no actual appeal to the audience's imagination in other Shakespearean plays, e.g. inKing Learin which the audience has to follow the imagination of the blind Gloucester who believes to climb a mountain at Dover cliff (without an actual mountain being on the stage), to mention just one example. Also, the audiences in Shakespeare's time were already used to use their imagination through theater performances due to the often bad seating (or even standing) positions and due to the fact that there were no elaborate sceneries or props yet.  Plays of that time were naturally meant to be listened to rather than to be watched. That and the following examples of the contradictions between the Chorus's announcements with the actions taking place afterwards, underlines the assumption that the Chorus actually says something else than he seems to do at first view. "We lose the better half of our possession" (1.1.8), "For I have made an offer to his majesty / Upon our spiritual convocation / And in regard of causes now in hand / Which I have opened to his grace at large, / As touching France, to give a greater sum / Than ever at one time [...]" (1.1.75-80). When Canterbury later presents the arguments as to Henry's right to claim the French crown, it seems that this fact is just a nice side-effect able to serve his and the Bishop of Ely's actual personal intentions. Canterbury's detailed argumentative explanations display how very well this plan was actually prepared. He gives a performance to convince the king as the Chorus gives a performance to lead the audience, just the way Henry himself later gives performances to excite his soldiers for his concern. As good as Canterbury's performance might be, Henry's integrity is not touched in this scene. Not just willing to start a war at any reason, he asks for prove and also for moral legitimacy: "May I with right and conscience make this claim?" 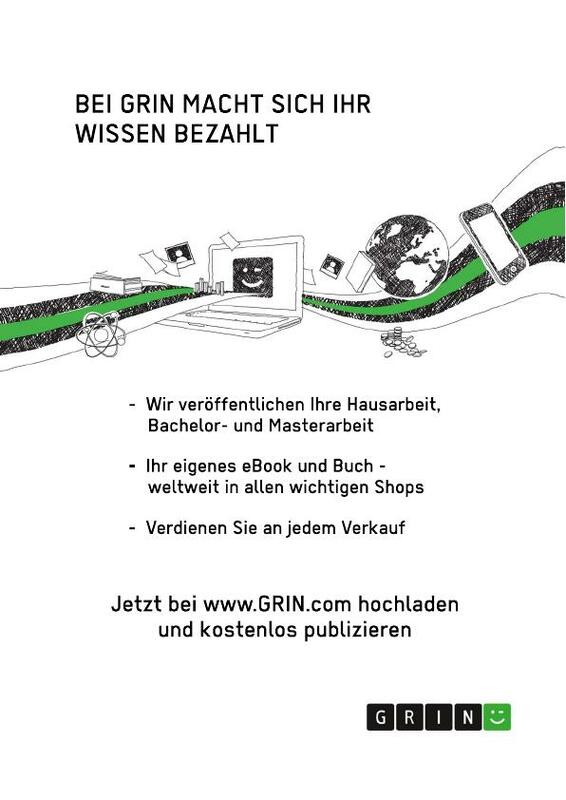 (1.2.96). Canterbury does not offer moral justifications, but he again gives historical reasons for a potential war. Although no one literally talks about war yet, but rather about the right to claim the French crown, it can be assumed that it is clear in everybody's mind that France will not simply give away her crown. 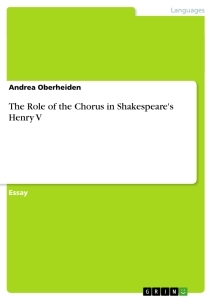 This essay offers a virtuosic study of the multifaceted role of the Chorus in Henry V. The supplementary material — from the classical writers to Brecht — helps this analysis very smartly, and the reading of the Chorus strikes a nice balance between looking at the text and theorizing about it at higher, more conceptual levels. This work represents a very satisfying inquiry into a play that offers many a surface diversion to distract its readers away from the kinds of ‘deeper knowledge’ offered here. The role of comedy in William Shakespeare's "Henry IV"